If you pay attention to battery storage and smart distributed energy in Australia, you might have whiplash from the seemingly rapid-fire announcement of government support initiatives over the last few months. Most of these schemes go beyond simply incentivising batteries for homes, taking steps to ensure that batteries (and other devices) can be controlled and coordinated to provide network services or virtual power plant (VPP) functionality. SwitchDin is an enabling technology for microgrids, VPPs and advanced network services. Get in touch to learn how we can work together. The table below provides a state-by-state roundup of what small-scale battery system support programs are now in effect or being floated around with a reasonable chance of implementation, while the text that follows provides more detail about each of the schemes. 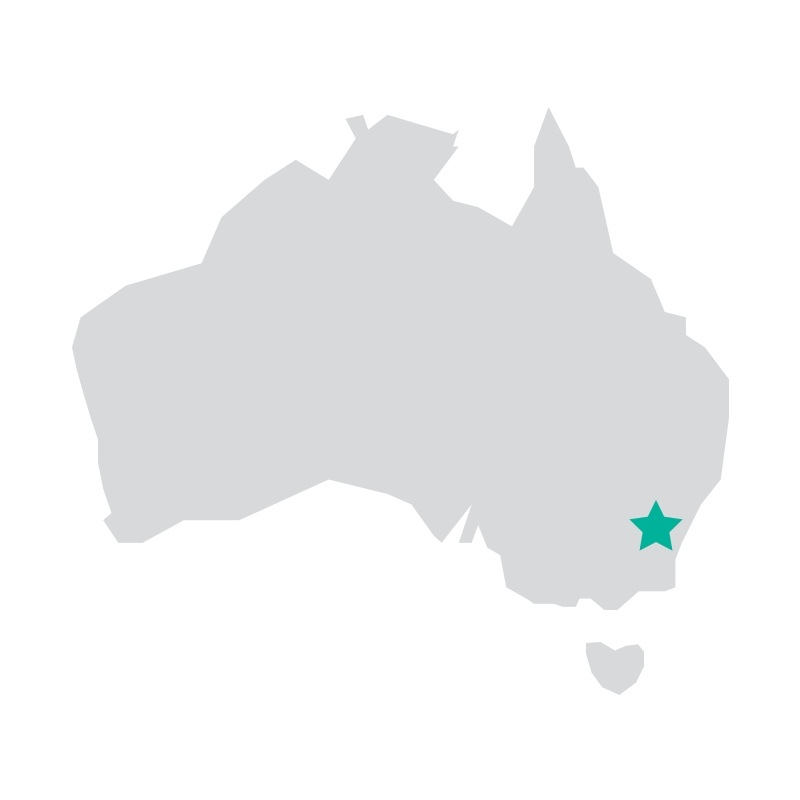 A roundup of existing & proposed battery incentive programs in Australia. The ACT has led the way in supporting batteries in distributed energy for several years now, with the territory’s Next Generation Energy Storage program about to enter its third round since 2016, with $3 million committed for the current tranche. The aim of the program is for 5,000 ACT households to have batteries installed under the scheme by 2020. Battery installations are incentivised on a ‘per kilowatt’ (power capacity) basis when the customer chooses a package from a pre-approved supplier using pre-approved products. The ACT is also running a 250-home VPP pilot program involving a subset of homes that have installed batteries under the Next Generation program, and is home to a lithium battery performance testing site. The NSW Liberal government has a collection of clean energy initiatives spanning an array of energy system elements. 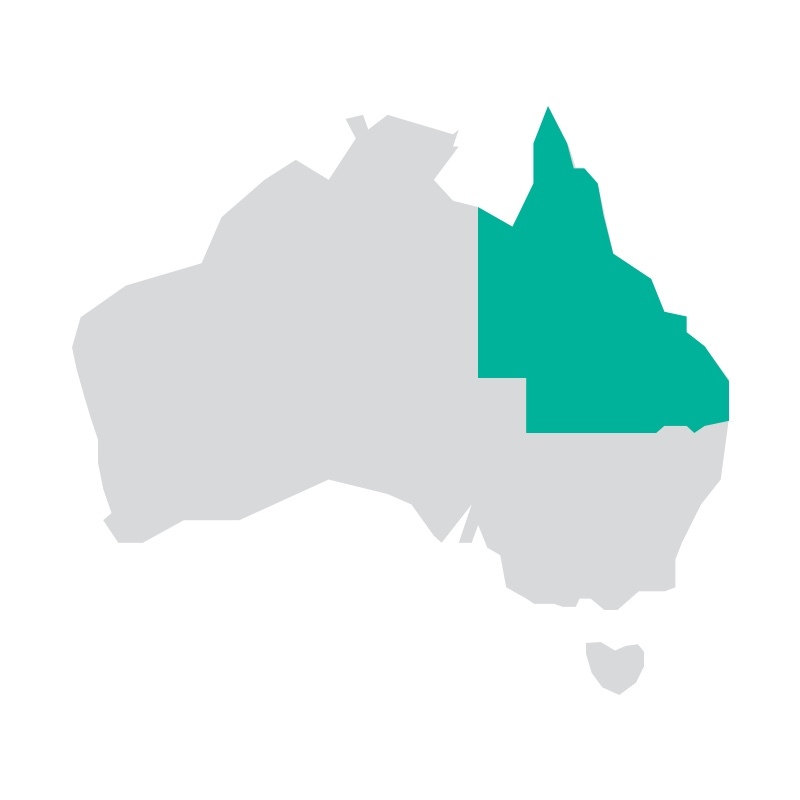 South Australia was the first Australian state (excluding the ACT) to introduce a state-wide battery incentive - the Home Battery Scheme - under the current Liberal government. The program will provide $100 million in funds to support the installation of up to 40,000 home battery systems. Even after a flurry of similar programs in other places, the SA program remains the most generous in the country, offering a subsidy of $500-$600 per kilowatt-hour (capped at $6,000) instead of a flat amount where size doesn’t matter. In order to receive the subsidy, battery systems must meet ‘virtual power plant ready’ criteria set out by the government. This program is separate from the ambitious SA Virtual Power Plant project, which could include battery systems for up to 50,000 households on a mix of public housing and privately owned properties. In the run up to the recent election, the incumbent Victorian Labor government introduced a series of major energy initiatives; the implementation of several of these were contingent on Labor’s being returned to government - which it was. With this, the second most populous state now has one of the most ambitious renewable energy agendas in the country, with a 25% target by 2020 and 40% target by 2025. The federal Labor party made headlines last week with its announcement of a suite of initiatives supporting battery storage & renewable energy with the stated triple goal of a) reducing emissions, b) lowering electricity prices, and c) improving energy system reliability. For households, the program of most interest is the proposed $500 per kilowatt-hour (kWh) incentive for battery storage systems up to 4kWh - or a maximum subsidy of $2,000 per system. The ALP says it will commit $200 million for up to 100,000 households; the party says this will be a stepping stone in a roadmap towards one million home battery systems by 2025. Households will not be allowed to ‘double dip’ into both state and federal incentives, and most of the state-based programs are more generous than the federal proposal. This means that if it comes into effect this program may become the default fallback option for homes in states without a dedicated battery program - a catch-all for the left-behinds. Other components of the party’s broad-reaching energy platform include a $5 billion ‘Energy Modernisation Fund’ administered by the Clean Energy Finance Corporation (CEFC), a 50% renewable energy target by 2030, and support for community-based energy programs. Labor is also promising to take up the National Energy Guarantee as the framework for its energy policy if elected. SwitchDin sees the introduction of these programs as the beginning of a wave that will hasten the (now unstoppable) transformation of Australia’s energy ecosystem. Interestingly, they are being delivered by governments from both of the major political parties - a pretty good sign of which way the winds are blowing. Incentive programs both state and federal initially played a huge role in making Australia the solar juggernaut that it has become, with some of the lowest PV system prices and one of the highest solar penetration rates in the world. These are two of the main reasons that Australia has become a globally-recognised hotbed for battery storage activity, with a number of overseas companies coming here to launch their products. We might have got here without incentives, but it certainly would not have happened as quickly; state-backed solar feed-in tariffs and the federal ‘solar rebate’ were the programs that coupled the idea of solar power and energy bill savings in the national consciousness. The presence of vast amounts of grid-connected solar that snowballed on from these early incentives has paved the way for new opportunities to develop - for example, a rapidly growing residential battery storage market and prospect of using distributed energy resources like solar & batteries to provide grid services and participate in energy markets. Will 2018 be ‘the year of the battery’? SolarQuotes’ index of interest in solar plus storage systems as of October 2018. Nationally, the average is about 9%. However, SunWiz data shows that the percentage of homes who installed batteries with solar in 2017 was actually about 12%. Battery storage is still expensive and most households won’t install batteries on purely financial grounds - yet (although VPP participation will help). But that doesn’t mean that Australians aren’t thinking about it. 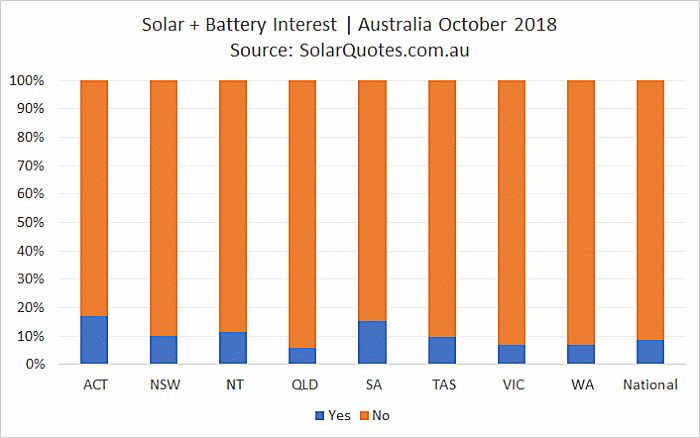 The SolarQuotes ‘Solar Systems Interest Index’ for October 2018 shows that around 9% of Australians considering getting solar are also interested in batteries; the percentage is around 15% in the ACT and South Australia, which have strong battery support programs. In reality, the percentage could be higher: Industry analysts SunWiz have noted that 12% of households who got solar also installed batteries in 2017, without the bevy of support programs that have since come into effect. Think about it this way: In August 2018 there was 142 megawatts (MW) of small-scale (<100 kilowatts, kW) solar installed in Australia, according to SunWiz. That translates into a bit over 20,000x 6kW systems. If just 10 percent of these installed batteries along with solar, that’s 2,300 new battery systems, while 15% would be 3,000 battery systems. Australia has already had 1 gigawatt (GW) of solar installed as of September this year, which on its own would translate into anywhere between 17,000-34,000 battery systems (assuming 10% to 20% of solar systems installed with batteries). On track for 1.3GW of distributed solar by the end of 2018, however, we could see as many as 44,000 new battery systems installed nationally by the end of the year in an optimistic scenario where the uptake rate gets up to 20%. By contrast, around 20,000 battery systems were installed in 2017. Once these programs are in place, we can expect the numbers to be even higher. Of course, there’s also the possibility that the promise of a federal incentive actually will have a dampening effect on battery uptake, as consumers put off getting batteries to cash in. Clearly, big changes are afoot, and SwitchDin is here to help tie it all together by enabling VPPs and distributed energy management. Get in touch to learn more about what we do - and how we can work together.